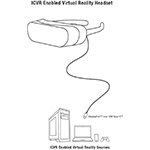 SANTA CLARA, Calif.--(BUSINESS WIRE)--ICVR, LLC has been founded by LG Electronics, Analogix Semiconductor, Tencent, and Dell to develop the Interface for Connected VR (ICVR™) standard, which defines how virtual reality source (VRS) devices, such as smartphones, PCs and other consumer electronics, connect and interoperate with head-mounted displays (HMD). An open industry standard for virtual reality (VR), augmented reality (AR), and mixed reality (MR) headset connectivity based on DisplayPort™ over USB-C™, ICVR carries high quality multi-channel audio, high-definition video, and the head tracking measurement data required to render the virtual environment between the VRS and the HMD. Industry standard content protection technology is also available. Separating the VR source device from the head-mounted display means that the VR HMD has no heavy battery, no warm CPU, and no transmitting radio next to the user’s head. This allows manufacturers to optimize the headset for high-performance, comfortable and immersive VR experience. The ICVR standard also simplifies mobile device architectures by removing the burden of more expensive screens and sensors required for phone-based VR applications. 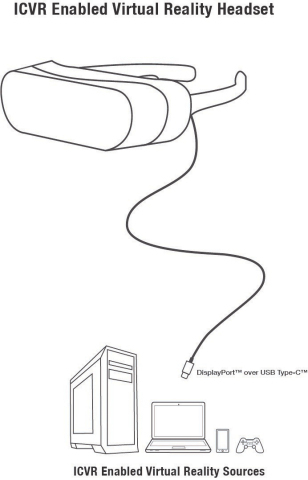 The universality of USB Type-C eliminates proprietary protocols and connectors, which is beneficial for the entire VR ecosystem. “Part of our leadership role is to help the industry define and drive open standards for technologies that can lead to better VR/AR/MR experiences. Connecting and powering a VR headset environment today involves multiple cables; our goal is to leverage a single cable connectivity solution that can simplify set-up and maintain the necessary performance and quality,” said Liam Quinn, CTO at Dell. The ICVR specification will be available for adopters who join ICVR, LLC in Q3 2017. Organizations interested in learning more about ICVR and how to become an adopter should send an email to: adopter@icvrllc.org. ICVR, LLC oversees and manages the development, adoption, and promotion of the ICVR Specification. The ICVR Specification was developed by LG Electronics, Analogix Semiconductor, Tencent, and Dell as an open standard for virtual reality headset connectivity. ICVR, LLC is a wholly owned subsidiary of Analogix Semiconductor, Inc.
For more information visit www.icvrllc.org, follow us on Twitter @ICVRLLC, or connect with us on LinkedIn. ICVR™ is a trademark or registered trademark of ICVR, LLC. All other trademarks and trade names are the property of their respective owners.